You’ll find the PMW-F55 CineAlta camera everywhere – from Hollywood features to episodic TV, commercials, promos, sports and more. Its compact size belies breathtaking 4K image quality and effortless adaptability. Better still, its extraordinary capabilities continue to evolve in response to the creative demands of film-makers worldwide. 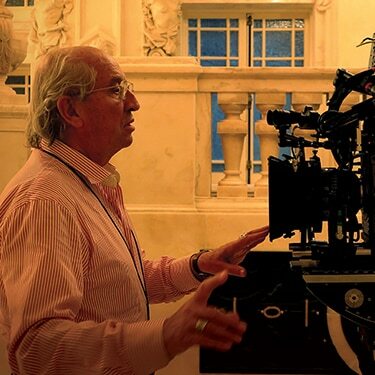 Photo: Berti Kropac, Director of Photography. 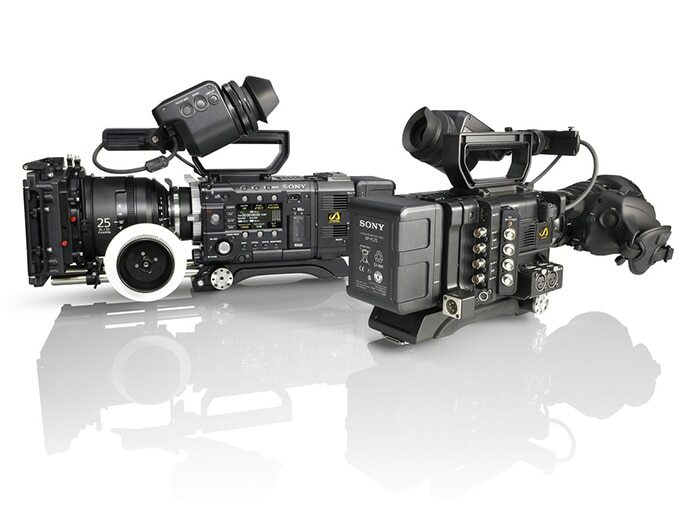 The versatile F55 brings films and TV shows to life with spectacular 4K detail, colour and dynamic range. No wonder it’s the go-to choice for many of the world’s most in-demand image makers. 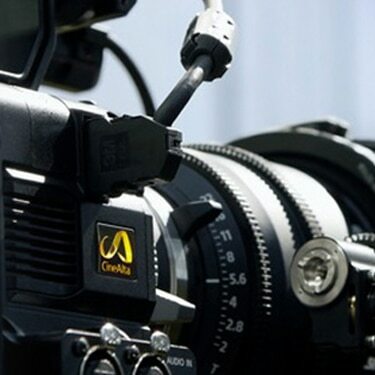 Compact, versatile and future-ready, the F55 gives cinematographers and directors plenty of good reasons to pick CineAlta. Find out why it’s the prime choice whenever you need superlative 4K picture quality and near-limitless creative options – today and tomorrow. 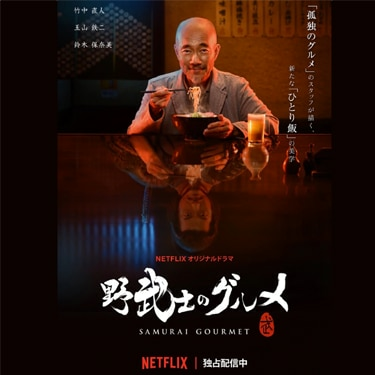 It’s everywhere – from major Hollywood features and world cinema prize winners to top-rated episodic TV and premium drama from online streaming leaders like Netflix and Amazon. And that’s just the start. 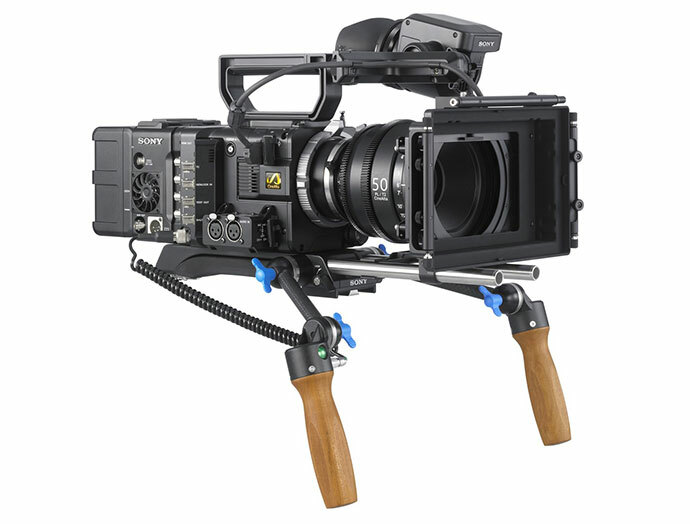 The flexible, highly modular F55 is an equally popular choice for documentaries, news magazines, indie shorts and music promos. It’s the camera that’s always evolving to keep pace with film-makers’ needs. Latest firmware for the F55 adds extended colour space support, high frame rate 16-bit 4K RAW recording, fresh ergonomic refinements and more. Why accept ordinary colour when you can go so much further? Our S-Gamut reproduces reds and greens that are literally beyond the reach of less capable cameras. Then we preserve every last nuance of colour with phenomenal 16-bit linear RAW recording. This encodes over 65,000 discrete shades of red. Plus 65,000 blues. Plus 65,000 greens. It all adds up to more than 275,000,000,000,000 possible colours. Want the ultimate in colour fidelity? Then you want Sony. High speed shooting with the F55 is your passport to exquisite slow motion. Capture 2K RAW at 240 fps for playback at 24p. You’ll get 10x super slow motion playback – perfect for catching fine detail of sports, stunts and explosions, as well as the exquisite beauty of our natural world. (Requires AXS-R5 RAW recorder, sold separately). 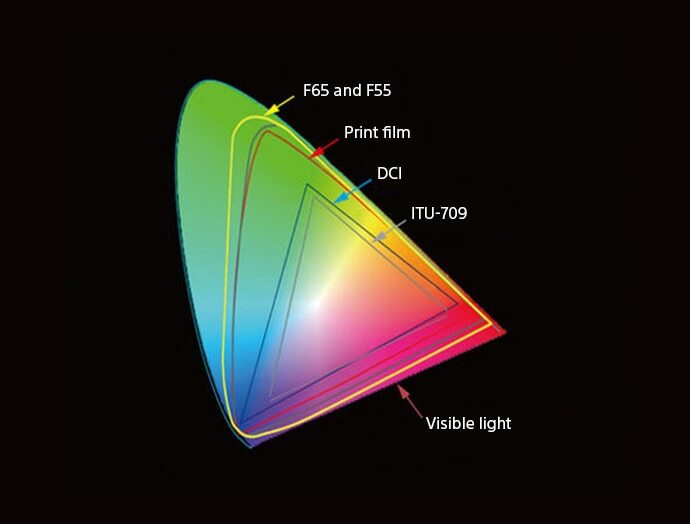 Before the F55, 4K digital cinematography cameras all had one thing in common. They couldn’t save your 4K footage – at least not without some sort of external recorder. It’s all different with the F55. Turbo-charge your workflow with full 4096 x 2160 resolution, captured on board with the all-I-frame quality of Sony XAVC I recording at a highly practical 240 Mbps (24p). ACES is a free, open, device-independent colour management and image interchange system that can be applied to almost any current or future workflow. It was developed by hundreds of the industry’s top scientists, engineers and end users, working together under the auspices of the Academy of Motion Picture Arts and Sciences. Sony has worked closely with the Academy to develop and test various implementations of ACES leading up to Version 1.0. As a member of the ACES Logo Program, Sony is committed to its cameras and related products and solutions supporting ACES-based workflows in the highest quality possible. The capabilities of the F55 extend far beyond the movie lot. Whether you’re shooting documentaries or news, the portable F55 has the poise and agility to keep up with your creative vision – wherever you are and whatever’s happening around you. An optional build-up kit brings you the familiar ergonomics and proper balance of a true shoulder-mount camera. There’s an adjustable shoulder pad and front block control for comfortably balanced operation. Other upgrades for power, wireless audio, lens support and RAW recording expand shooting possibilities in a wide range of field-based applications. Rigged for Live Production, it’s also an ideal choice for capturing sports and cultural events in pristine detail-packed 4K. 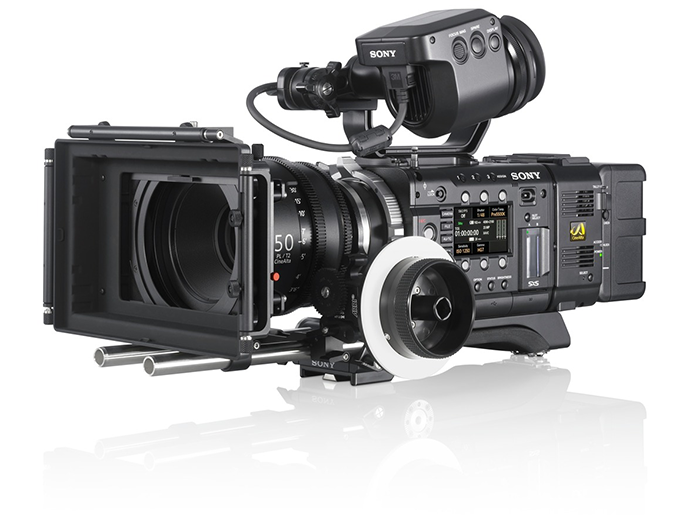 The F55 fits right in with broadcasters’ workflow, giving OB crews the reassuring operation and flexibility they’d enjoy with any conventional Sony HD system camera. High Dynamic Range (HDR) takes viewers’ engagement to the next level with brighter highlights, deeper blacks and richer colours. You’re all ready to shoot in HDR with the F55 – opening up exciting new creative possibilities for audiences to enjoy, today and tomorrow. It’s all about you. And we’re constantly refining the capabilities of the F55 by asking real-world cinematographers what they want. Like this intuitive new Quick Menu function that makes it easy to perform everyday tasks on the camera’s sub-display at a touch of the Option button. You’ll spend more time making effective creative decisions. And less time diving deep into menu options. *2 These are the supported formats at launch and will be added by future upgrades. *3 Some frame rates are not supported at launch and will be supported by future upgrades. *4 To be supported by future upgrades. 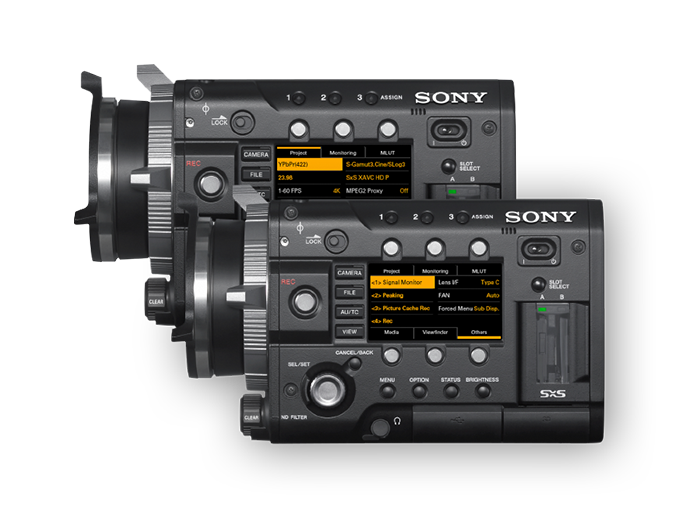 Digital cinematography cameras from Sony. Discover our Knowledge Portal and learn online with Sony professionals. Shot in 4K HDR with F55. Short Shotgun Electret Condenser Microphone.